Do you know what Search.searchisemail.com is? Polarity Technologies Ltd has developed a new legitimate-looking search tool Search.searchisemail.com recently. Since it has been created on the same template as Search.yourpackagesnow.com, Search.yourmapscenter.com, and Search.youremailnow.com, which are older products of this company, our specialists have realized that it is a Polarity search tool too quickly. This finding has immediately revealed that Search.searchisemail.com is not a search tool that can be trusted either. In fact, experienced researchers do not call Search.searchisemail.com a search tool. Instead, they refer to it as a browser hijacker because it changes browsers’ settings without permission. Not all the users notice a new search tool set. Others do not really care about the presence of a new search provider because it looks quite trustworthy. Unfortunately, the truth is that, in reality, it is not. You will see that your preferred page is gone after its successful infiltration. On top of that, you might see ads if you use Search.searchisemail.com as a default search tool. Needless to say, using it as a default search engine is not a very good idea. You will find all drawbacks it has listed in the next paragraph of this article. Also, you will find more about its removal if you read it till the very last sentence. There is the second reason Search.searchisemail.com is said to be an untrustworthy search provider. Research has revealed that it might collect personally-identifiable information, which is surely not a feature of a reputable search provider: “BY USING THE SERVICES, YOU ARE CONSENTING TO GRANT POLARITY PERMISSION TO COLLECT YOUR URLS AND SEARCH DATA, INCLUDING SEARCH QUERIES THAT MAY CONTAIN PERSONALLY IDENTIFIABLE INFORMATION, SHARE THEM WITH THIRD PARTIES, AND USE SEARCH-RELATED COOKIES.” Next to personally-identifiable information, it will also automatically gather non-personal details like the type of browser used, the type of the operating system, geographic location, Internet Service Provider, websites visited, and other details. The recorded data will be used to improve the service and present users with relevant products, offers, and services. Unfortunately, it might also end up in the hands of third parties, specialists say, so problems might arise. You can prevent this from happening, of course. All you need to do is to remove Search.searchisemail.com from all browsers as soon as possible. 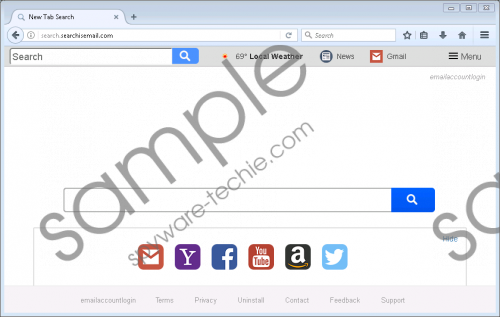 No matter you have set Search.searchisemail.com on browsers yourself (we believe that you have not done that), or this browser hijacker has been installed on your computer as part of the software bundle, remove it from browsers without consideration. Before you take action, consult our manual removal guide located below the article. Tap Alt+T and click Internet Options. Click on the Advanced tab and then click Reset. Mark the box next to Delete personal settings. Find Refresh Firefox at the top and click on this button. In the confirmation window, click Refresh Firefox again. Launch Google Chrome and open its menu (Alt+F). At the very bottom of the page, click Show advanced settings. Click on the Reset settings button. If a new search tool is set on your browsers without your consent ever again, it means that a new browser hijacker has slithered onto your computer. You should not use the search tool you see to perform web searches because it is untrustworthy and might cause a bunch of problems. We have two pieces of advice for those users who do not want to find their browsers’ settings altered again – 1) stop downloading software from dubious pages and always choose the Advanced installation option when installing new software; 2) enable an automatic tool on your computer. Tags: delete Search.searchisemail.com, remove Search.searchisemail.com, Search.searchisemail.com.